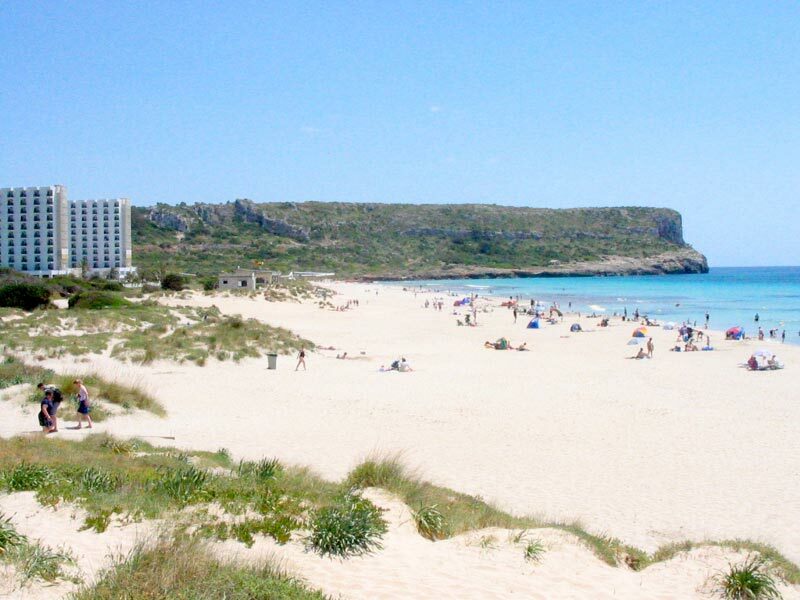 Son Bou has the longest and some say the finest beach in Menorca - over 2km of fine golden sand, making this area ideal for families, sun worshippers and water sport enthusiasts. The sand shelves very gently into the sea making it safe for smaller children to paddle in and older ones to swim. However like all beaches Son bou can suffer from quite strong currents running down the beach, so care should be taken and an eye kept on the red cross warning system. Along the beach can be found several beach bars and a good variety of water sports along with sun beds and umbrellas. Be warned if you blush easily the further you walk along the beach the less people have on, Son Bou is very well known for the naturist's who use it. At the eastern end are the two Sol hotels built right on the beach, behind these is the main commercial centre with a generous choice of eateries catering for all tastes and budgets, plus a couple of good bars, shops, bars including a show / night club type bar with live entertainment most of the season. The area boasts plenty of shops ranging from the usual tourist buckets & spades to designer outlets. You will also find supermarket, chemist, medical centre, car hire and money exchange etc. Behind the beach, and running the full length on the hill above is a large development of privately owned 'villas, between these and the beach is the area known as San Jaime. San Jaime was built with family holidays in mind, everything necessary for a family holiday are on hand, including supermarkets, shops, restaurant, chemists, medical centre and the well known Club San Jaime with it's small water chutes. Torre Soli Nou. is a residential area situated at the western end and atop the hill side overlooking Son Bou beach. It can be quite a trek to the beach and commercial areas but transport is usually provided by the larger holiday complexes. 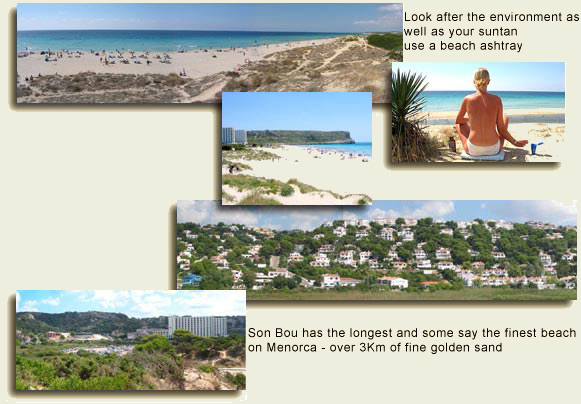 Son Bou's position half way along the south coast makes it ideal for exploring the island. It's only a 30 minute drive to both Mahon [Mao]and Ciutadella the former capital. Alaior a small bustling market town with plenty to offer the dedicated shopper is easily reached by bus. Buses also run to other towns and resorts in both directions and into Mao and Ciutadella. Down a side road, off the Alaior to Son Bou road is the prehistoric village of Torre d'en Gaumes. 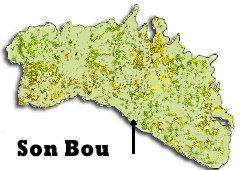 This is one of the largest talayotic settlements on Menorca and was in use for well over 1000 years, it is well worth a visit as are most of the prehistoric sites on the island. A small fee is charged on entry to some, this helps to pay for the up keep and preservation of all Menorca's history. Son Bou is also home to one of only three Christian Basilicas on Menorca [the others being, one on the Isla Del Rei in Mahon Harbour and the other just past the airport on the road to Sant Climent]. This is situated at the eastern end of the beach at the side of the two Sol hotels. The remains of the entrance porch, three naves separated by columns and the baptismal font can still be seen.